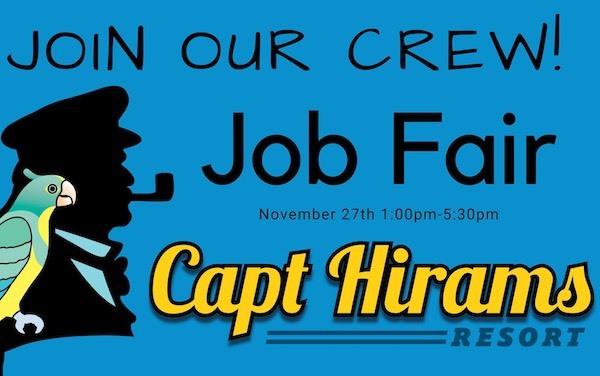 Captain Hiram's Job Fair in Sebastian, Florida. SEBASTIAN – Looking for Employment? Join the Captain Hiram’s Resort. The resort will host a job fair on Tuesday, November 27, 2018, at 1:00 p.m. – 5:30 p.m. to fill a variety of positions. The positions available include Line Cooks, Servers, Barbacks, Bartenders, Dishwashers, Daytime Bussers, Daytime Food Runners, Boutique Sales Clerks, and Front Desk Attendants. Applicants must have a flexible schedule and be able to work weekends and holidays. Be prepared to be interviewed on the spot.